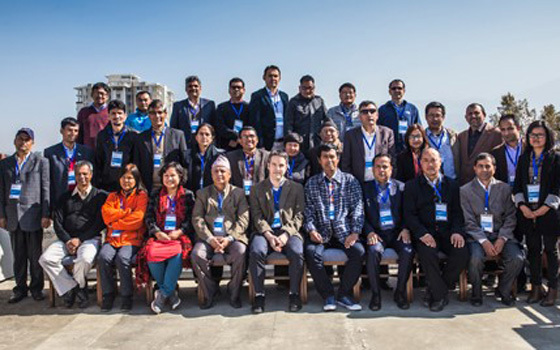 At the regional review and planning workshop held in Kathmandu, Nepal, this January, Himalica pilot implementing partners from Bangladesh, Bhutan, Myanmar, Nepal and Pakistan met to review their progress in 2016. They used the workshop as a sounding board for developing their 2017 action plans. In his welcome speech, Dr. Eklabya Sharma, the Director of Programme Operations at ICIMOD, called on everyone to intensify their efforts to achieve all the objectives of the Himalica programme by the end of 2017. On the first day of the workshop, pilot partners from the five Himalica countries took turns presenting their 2016 work; they focused on their achievements, challenges, and key lessons learned. On days two and three, participants reviewed the 2017 action plans, including the activities and the milestones for gauging their progress. As Himalica adopts a holistic view to climate resilient interventions, sessions focused on a wide range of topics, including gender, governance, social inclusions, knowledge management and communications, and partnership strengthening. Himalica is currently running six pilot projects in five countries to demonstrate 1) institutional strengthening; 2) improved natural resource management practices; and 3) income diversification through the development of value chains of niche products and services such as tourism, vegetables, yak meat, sea buckthorn, bamboo products, and cardamom. Aga Khan Rural Support Programme, Pakistan. ICIMOD’s Himalica programme is funded by the European Union.